THE TAKEAWAY: Donors can only claim a tax deduction on donations made to organisations that are endorsed as a deductible gift recipient (DGR). Gaining DGR status is not as easy as you might think – it requires a lot more than just being able to prove your not-for-profit status or your worth to society. Donors can claim tax deductions for gifts to DGRs in their income tax returns, but there are rules about what sorts of organisations can claim DGR status, and about the types of gifts eligible for deductibility. Who can and cannot be a DGR is defined by tax law – with only certain types of organisations eligible. Some larger organisations are listed by name in Australia's income tax law (for example, Amnesty International) and are automatically classed as DGRs. Others must fall within a general DGR category set out in income tax law. To become a DGR, your organisation needs to fit the requirements set down in law and be endorsed as a DGR by the Australian Tax Office. Be in Australia, or have the relevant fund, authority or institution in Australia. 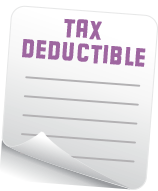 OUR TIP: The laws governing deductible gift recipient status are really complicated. Equip yourself with the basic information you need using the ATO’s Induction Package for Not-For-Profit Administrators, but then see if you can find yourself a (preferably pro bono) lawyer to guide your organisation through the process.